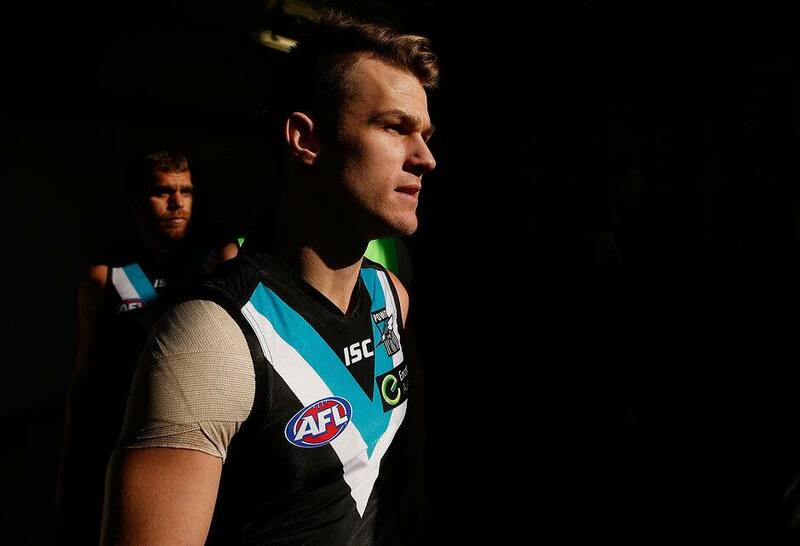 Robbie Gray walks into battle again in 2015. His second John Cahill Medal came on the back of another incredible season. ROBBIE Gray has become just the third man to win multiple John Cahill Medals as Port Adelaide’s best and fairest AFL player after narrowly beating home Chad Wingard in the 2015 count on Saturday night. Gray won his second consecutive John Cahill Medal, holding off a fast-finishing Chad Wingard in the final rounds of the count. In fact, had Wingard polled better in the Power’s final game against Fremantle, the margin would have been within single digits in either’s favour. Wingard came within one vote of Gray after the Power’s Round 22 win over Gold Coast. But Gray was undeniably the most consistent Port player of the year, polling strongly in every game he played to net the coveted award at the Adelaide Entertainment Centre. As a result of his 2015 achievement, Gray joins Kane Cornes and Warren Tredrea as the third multiple winner of the John Cahill Medal. He credited his teammates for their work on the field in 2015, saying his achievement wouldn't be possible without the continual push he's given by the men with whom he shares the responsbility of wearing a common Port Adelaide guernsey. “You don’t get these sorts of things without lots of hard work, but much of it comes from your teammates’ work,” Gray told portadelaidefc.com.au. “You don’t just get your hands on the ball yourself, you need the help of others, and the support of others, to have them keep on pushing you. “I’m lucky I get to run around with these guys every day, and just play footy and enjoy playing footy. Jack Hombsch finished third in the count after a strong and consistent start to the year, which saw him lead the count at one point. It is the first time Hombsch has finished inside the top three, with many considering him a frontrunner for the award midway through the season. Power skipper Travis Boak was fourth in the count after earlier winning the Fos Williams Medal, while Justin Westhoff rounded out the top five after a consistent finish to the year. Brad Ebert was again the early leader in the vote count, however fell away like many teammates through the middle of the season. Matthew Broadbent, Hamish Hartlett, Paddy Ryder and Ollie Wines rounded out the top ten.